The technical support and maintenance center of Russia’s Ural Airlines is looking to increase the scope of operations by at least 25% this year. It will shortly start performing all types of heavy checks on the Ural Airlines fleet. 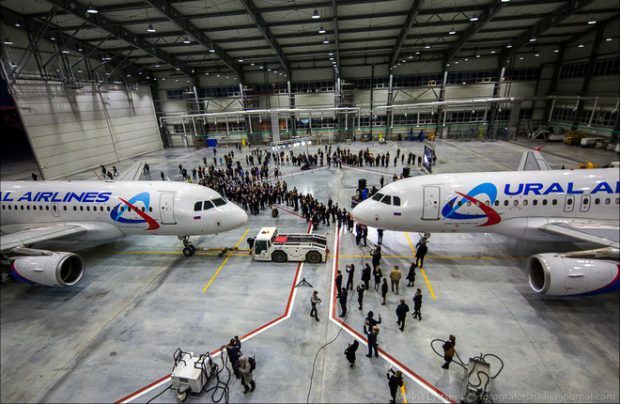 Ural Airlines MRO center was established in January 2015. It carried out 1,028 weekly checks, 165 A-check capability last year, and performed 18 C-checks during its second year of operation. The company also introduced heavy D-check and serviced five aircraft at its site in Yekaterinburg, Ural region. To compare, in 2015 the facility performed over 1,000 weekly checks, some 200 A-checks, and nine C-checks. The company replaced 16 engines (against 11 in 2015) and 820 wheels, mostly all of them on the carrier’s own fleet, a Ural Airlines source told, although the MRO base regularly performs weekly checks on aircraft operated by other Russian airlines. Two of the C-checks were performed on third-party Airbus A319s in 2016. The facility also provides on-call maintenance services for a Turkish airline under an active contract and a certificate issued by the Turkish civil aviation authority. The director of the MRO center, Igor Poddubny, sounded rather skeptical in his interview for Kommersant daily in the fall of 2016 when commenting on the prospects of attracting foreign customers. He said at the time that long-term base maintenance contracts would hardly materialize in the current situation because Europe offered a broader choice of MRO options and there were neither legislative barriers nor customs restrictions there. The Ural Airlines’ maintenance center is certified to service the entire Airbus А320 family. The company has reportedly considered introducing maintenance operations onBoeing 737s, but its representatives say the possibility of putting new aircraft types in operation is still under consideration as the carrier is studying the market and has yet to make a decision. As reported earlier, the airline invested $25 million in its own MRO base and expects the payback period to be about seven years. In its first year of operation the MRO base saved Ural Airlines more than 100 million rubles (about $1.7 million at the current exchange rate).